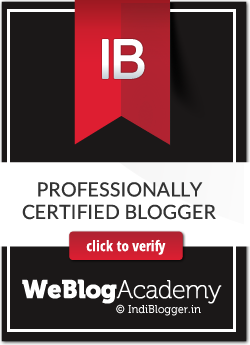 “You have never trekked in your entire life? What made you think this was easy?” asked the trek lead. “We came for adventure” they replied. To which, the trek lead said, “Adventure? Nali Chi Vaat? With sports shoes?” That’s when I could see the hint of tension in their eyes. 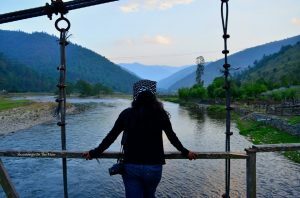 Sensing the same, our trek lead continued, “Koi baat nahi. Dekhte hai” (Let’s not worry now. We will manage). 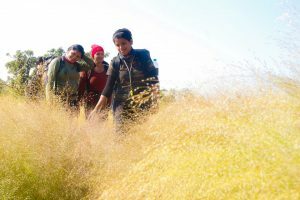 This happened when two people in our group turned up to be first time trekkers opting for HCG via Nali Chi Vaat as their life’s very first trek. That too, without proper trekking shoes. Some risks in life are worth taking. Some fears are worth facing. Some trails are worth following. And, all peaks worth climbing. Because, the view from top is worth all risks, fears, perturbations and pain. Harishchandragad. 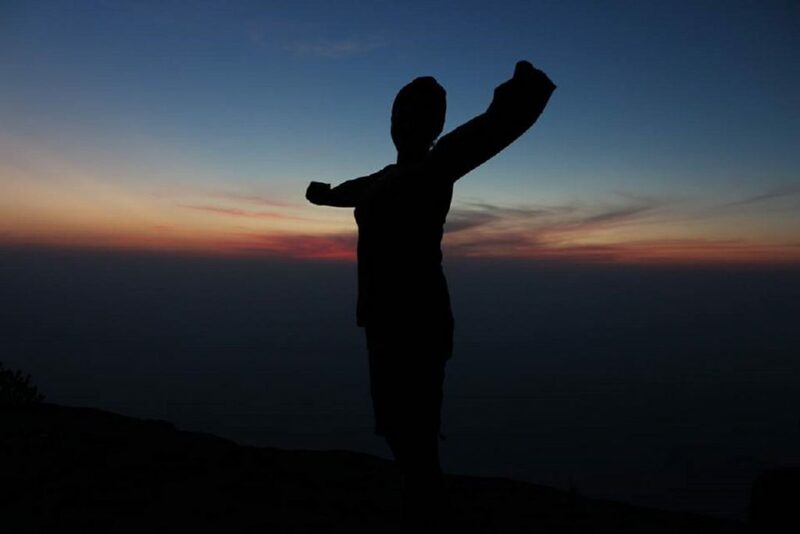 Mention of the name evokes muddled responses and few of the first things that come to one’s mind are the mighty Konkankada (Konkan Cliff), the 5 feet tall Kedareshwar Shivalingam and the many routes to climb to the top. I have already mentioned about Harishchandragad in delineation in my previous post. You may like to read through about the architecture, facts and history here. 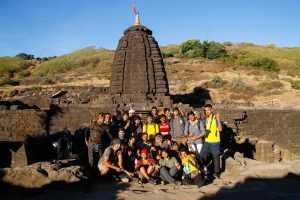 Harishchandragad is a hill fort famous for it’s accessibility via multiple routes, the most daunting one being Nali Chi Vaat. The literal translation of Nali Chi Vaat is “The Gorge Path” where “Nali” in Marathi means “Gorge” and “Vaat” means “Path”. 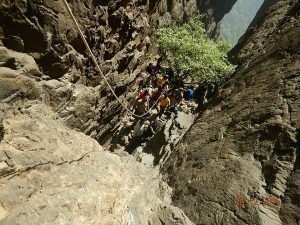 Nali Chi Vaat is the toughest route to climb Harishchandragad. The name itself is sufficient enough to scare the living daylights out of someone, let alone going through pictures. 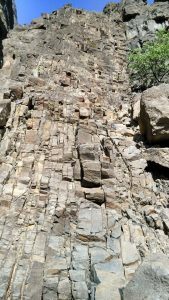 The entire route is a rocky terrain with a combination of small to colossal rocks of heterogeneous geology. The climb is almost 80 degrees steep with 4 rock patches to be covered in all. On top of everything, the rocks are loose, even the biggest of them can come tumbling down any moment. The smaller ones form heavy talus which makes the trail more treacherous. Hence, one has to measure his / her steps before trying to get proper foot and hand holds. 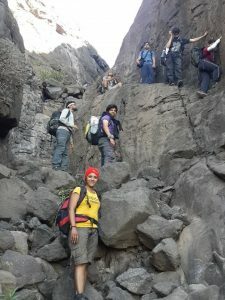 With winter at it’s peak, I decide on going for another adventurous trek to Harishchandragad – ascent via Nali Chi Vaat and descent via Rajmarg aka Junnar Darwaza, the two most thrilling routes. Christmas night, 25 souls bitten by adventure bug, started our journey from Mumbai towards Belpada, the base village in Ahmednagar district of Maharashtra, India. 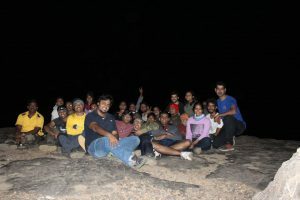 Vikram Singh led the trek. We reached Belpada around 3:00 AM. 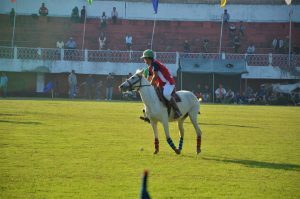 The intensity of the wind with supremely chilled temperatures made everyone shiver. We took a nap till 6:00 AM and were ready to start for the trek by 7:00 AM. We were informed that the entire trek would take around 6- 7 hours to complete. Had a smooth start. The first patch, that was 30 feet high, climbed with the help of safety ropes without any hitch. The second climbing patch was most menacing, since the entire patch had loose rocks. We were fore-warned by Vikram about the same. The trick to remain unhurt was to maintain distance between each other while climbing and call “watch-outs” to save your trek buddies from the rocks falling off. Well, I wasn’t among the lucky ones to be spared. While I was waiting for others to move ahead, a rock came tumbling down and within fraction of seconds, before I could move away, it hit my leg just above my ankle and BAM… a loud scream escaped my throat. After a quick first-aid, a swollen leg and a few minutes of rest, I was once again ready for the climb. The Nali or the gorge ends after this patch. The third patch was traverse through the forest with complete package of scree and talus. A smaller climbing patch towards the end and we reach a plateau. We took the much needed long lunch break after completing the third patch. The last and final leg of the ascent comprises of ascent through the forest for 40 odd minutes. Walking- hopping- climbing- crossing- escaping falls- panting- resting and repeating, we finally completed our trek and reached Konkankada an hour earlier than the time that Vikram had anticipated at the start of our trek. Refreshed at Bhaskar Dada’s (our local contact for HCG treks) lair and went back to Konkankada to view the sunset. Sitting on the Konkankada, facing the valley with fiercely chilled air brushing against the face and to see the sun melting beyond the horizon, splashing colors across the breadth of the sky is the most beatific view one could experience. I turned speechless and could not help myself from drowning in my thoughts. Post dinner, some of us decided to get cozy inside the tents and the rest went ahead to enjoy the bonfire on Konkankada. Vikram showed the Konkan Darwaja route. Coming back to Konkankada, everyone settled around the bonfire to keep away from freezing. Countless mind boggling spooky tales were the major attraction of the night. The Junnar Darwaza was used as the principal entrance to Harishchandragad and hence the name Rajmaarg (The Principal Route). This route had proper stairs carved on the rocks with fortifications. With continuous water flow during the monsoons, the rocks started to loosen up over a period of time which led to discovery of other alternate routes (Pachnai and Khireshwar) to access the hill fort. I somehow managed to survive the super windy and chilly night. After having done with breakfast and tea, we started off for temple visits and the Kedareshwar Shivalingam. 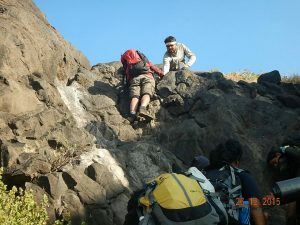 The earlier plan to trek to Taramati Peak was deferred due to time constraint and we started our descent via Rajmaarg. This route is quite steep at the beginning and covered with talus. The Ghanchakkar Range, The Kalsubai Range (AMK – Kalsubai) and The Ajoba Range are very clearly visible from the top of HCG. Additionally, the entire Malshej Ghat Range till Bhimashankar can be viewed when descending via Rajmaarg. Everyone completed the descent without major glitches. The major highlights of the trek were Ayush and Mahesh (the first timers), who completed their trek and their shoes survived sans respective soles to remind them of their adventure. They were given the grand salute by the entire team. 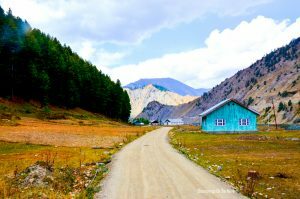 The return journey till Khubi Phata was a bumpy and thrilling ride on a tractor back. After having failed to stop any vehicle on the highway, we decided to have a long tea break till our vehicles arrived. One more adventure came to close with all smiles. Re-living the moments while accounting my treks is a wonderful way to time travel. 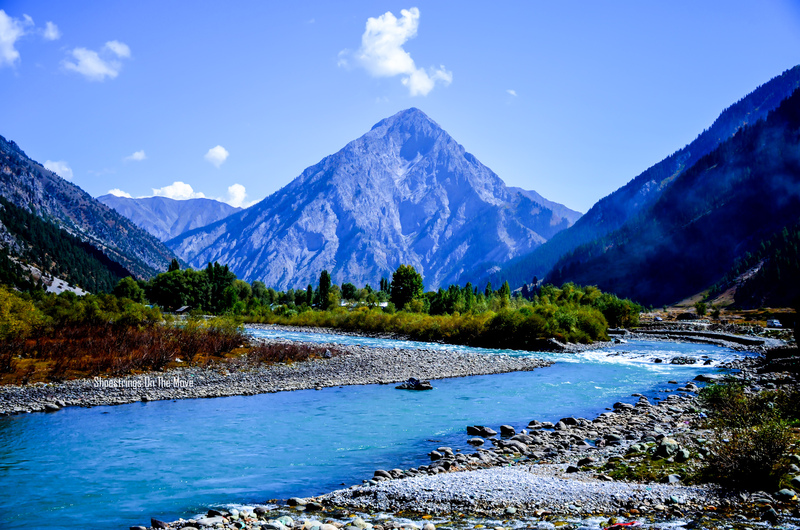 Best time: Best time to trek to HCG via Nali Chi Vaat is November to February because of the fairly low temperature. March to May and September to October are pretty hot and humid and since this route is a longer one, it could turn too tiring with higher levels of dehydration. 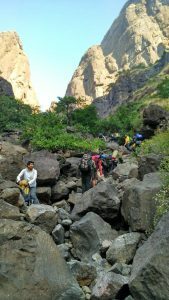 Monsoons are again not a good time to trek through this route due to heavy water flow. Only expert trekkers can trek through this route during monsoon that too after all safety measures are taken into consideration. With sheer perseverance, discipline, faith and belief in self, one can certainly conquer the unconquerable. At the same time, it also makes us realize the supreme power that nature holds against all odd perceptions we humans have about subjugating it. I would love to read your thoughts on this. Please leave your comments and share if you have liked it. Loved the way you've shared your experience!! And pic with shoes is classy – Something I always love to do!! Wow…that seems like an arduous climb and fun too! Wonderful, Great to read. Beautiful pics. Wow! Great reading your adventure .. your pics look awesome .. they just take my breath away ! you have started making me Jealous not babe…got to take me one of these adventures 🙂 awesome!!! Thanks Raj. That pic with shoes was the most hilarious moment. Everyone kind of started encouraging us. We had to make several attempts before we got the perfect shot. Yes Ami. The climb is too tiring since it is a long un-ending climb. But the moment we reached konkankada and viewed the valley below, each and every moment of the climb seemed worth it.